The series did not get off to a very good start for Stu and I – Wolf’s Pit in March may now seem a very long time ago. What should have been an enjoyable day out at Shatton turned into us spending the day in the Northern General Hospital as Stu managed to fully rupture his quad tendon in his left leg while taking pictures of the junior race. Emergency surgery to reattach it and then lots of rehab was not really the idea, oh well. Then, fast forward to the last race in the series Grin and Bear it and Stu managed a 10 mile run over peat bog to follow the race – amazing progress. He has even threatened to leave me with the camera at Wolf’s Pit 2015 as he may just run the race. The other issue we had to deal with was the cancelation of Windgather Fell Race due to unreasonable requests from the Forestry Commission to use their land. The good news is we have just heard this has been resolved and the race will go ahead next year. This had big implications on how the results for the Series would be calculated and the number of races needed to count. 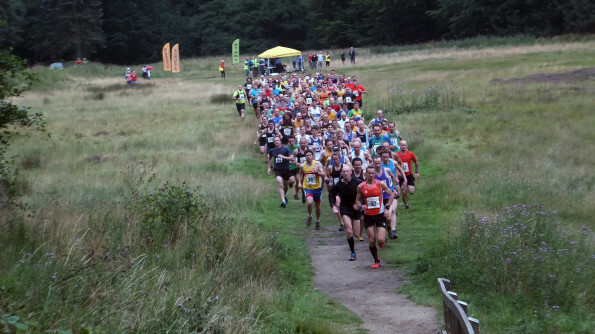 Luckily we managed to find another great race to replace Windgather, so up-stepped The Cubar Commotion – a great success in its first year due to the number of entrants. Plus, the call was made to make it only 4 races to count for the series not the intended 5. The highlight for me was the number of people who raced the series, or even just took part in one of the races. Some completing in there 1st fell race, for others it was the challenge of upping there mileage to complete Cubar Commotion or Grin and Bear it. As ever the growth of the Gritty Series is excellent and it is fantastic seeing the young people race. The weather has been very kind to us this year- I don’t think we had a wet race. The Gritstone Series races have raised hundreds of pounds for the local communities from schools to Mountain Rescue. The whole idea of the Series has been to promote the quality of local races in the Dark Peak area (Gritstone). To ensure they thrive and provide good races for us runners. There is never a charge to enter the Series merely your commitment to run these fab races. The clear winner of the Men’s series was Team Accelerate athlete Stu Bond. He seems to have become stronger and stronger as the series went on. Although he does seem to have frustrating missed out on course records sometimes by seconds! 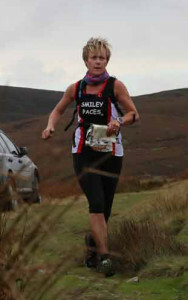 The ladies winner Gay Fletcher, Smiley Paces, is the only person to complete every race in the series, an excellent achievement. They will each receive a £100 Inov-8 voucher. Two Totley runner secured the 2nd places, Steve Franklin and Pat Goodall. At 59 Pat has had an amazing year as she set herself the challenge of completing 60 races in her 60th year and could be seen at all races with a label on her back letting us know how many races she had completed. She threw herself into the challenge and soon found herself heading towards the 100 race mark. Martin Dawson, North Derbyshire RC, had 4 consistent good run to take 3rd place in the men’s. Ellie Crownshaw at 17 years old could only complete 4 races due only been able to enter races under 6-miles. However she did well in all 4 races and secured 3rd place. It is excellent to see a former Gritty Series winner performing so well in her 1st session in adult races. She has also won the English Schools fell championships this year. One to watch out for! The most notable ladies vet performance was Team Accelerate/Scott Dot Kesterton. Coming an amazing 5th overall in the series taking the V60 ladies win. Keith Holmes completed Grin and Bear it to get 4 races in and take the men’s V60 win. Peter Hague had a consistent season to win the V40 and Gavin Williams once again won the V50 category. A great set of races- big thanks to all the race organisers and marshals who make these races possible. Also to Inov-8 for their continued support of the series. Next year we will have the same great race but there will be a change to the series. Watch this space……..
Mr Bond on his way to Victory at Salt Cellar with a New Course Record.